105 days. Cucurbita pepo. Open Pollinated. Plant produces 4 to 7 lb dark orange pumpkins. 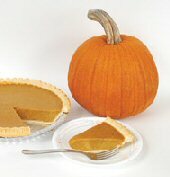 The flesh is dry and stringless, making it one of the best for pumpkin pies. A good variety for the home garden. Excellent choice for home gardens, farmer's markets, market growers, and open field production. Certified Organic. Choose the sunniest and largest area in your garden. Plant 5 to 7 seeds outdoors in hills. Planting should in early spring to mid-summer, 3 weeks after last frost and when soil has warmed up to at least 70 F. Plants grow 2 ft tall and vines spread up to 10 ft. Protect ripening pumpkins from damp ground by placing them on boards. Cut pumpkins carefully from plants to prevent damaging the vines.